Just over a week ago Android users that also own an Xbox 360 were treated to the SmartGlass application that lets them control certain things on the console via their mobile device. In the meantime users on the iOS platform were left waiting, and now we can tell you that Xbox SmartGlass for iOS has been released but the iPhone 5 is not compatible. After the initial release onto the Android platform users of the iOS platform can now access the free application as long as they have an Xbox Live membership, and as GottaBe Mobile are reporting users will get a number of features that can be controlled via the iPhone or iPad. Once the app has been installed users can control the start screen on the Xbox, as well as using the mobile device to type out messages or search for content from the console. 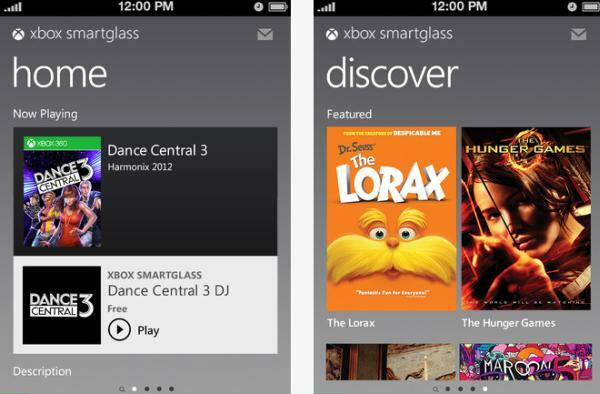 The SmartGlass app also turns compatible mobile devices into a secondary display for content on the console such as TV or movie information. Users can also see stats from a sports game and control certain parts of compatible games, which currently include the likes of Dance Central 3 and Halo Waypoint. When playing Dance Central 3 there is the opportunity for users to line up music tracks from the game, so then you don’t have to keep stopping to select another track. Other features of the SmarGlass application include controlling music and videos on the console, search the catalogue of music, games, and videos stored on the device, message Xbox friends, keep track and compare achievements with other users, edit profile, and much more. The app description says that it is compatible with the iPhone, iPad, and iPod Touch running iOS 5.0 or higher, but there seems to be a problem with compatibility with the iPhone 5. A couple of users have complained it isn’t compatible with their iPhone 5’s, but we have managed to install the app on an iPhone 5 but didn’t have an Xbox Live account to test the app ourselves at the time. If there is no compatibility with the iPhone 5 this will be a major oversight by Microsoft considering the handset has proved to be pretty popular since its release, and it’s the latest flagship smartphone from Apple. Head over to the App Store to download SmartGlass yourself. Have you managed to get the app working on the iPhone 5? Mine won’t connect to the Xbox even my settings on the console are on.